This is a SUPER simple recipe that looks really fancy and is really fun to make. If you have helpers, the prep goes fast and feels more like arts and crafts than cooking. 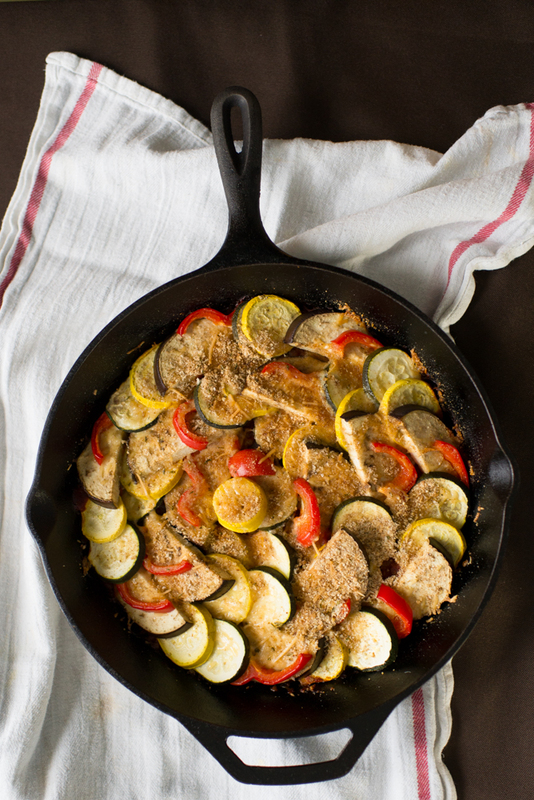 If your kids have seen the Disney movie, “Ratatouille” then they will love making this fun summer dish (and may end up eating a lot of veggies along the way!) We made this in our cooking camp recently and the kids had a blast. We put the extra cut up raw veggies in “nibble bowls” for the kids to snack on. Preheat oven to 375 degrees. Place tomato sauce on the bottom of a medium-sized oval or round oven safe dish or skillet. Drizzle one teaspoon olive oil and gently stir with onion and garlic. Season with salt and pepper. Slice veggies with a knife or mandolin about 1/16 inch thick. Place zucchini round at the edge of the pan on top of tomato mixture. Lay squash on top but slightly to the left so that the edge of the zucchini is visible. Lay down eggplant , then red pepper. Follow the same pattern until the outside edge of the pan is covered. Make another formation on the inside until all the tomatoes are covered. Drizzle with remaining olive oil. Remove thyme leaves from stems and sprinkle on top with salt and pepper. Sprinkle with parmesan cheese and breadcrumbs (or gluten-free alternative). Cover with parchment paper that is cut to the inside dimensions of your pan. Bake 45 minutes until veggies ares soft, but still have their shape. Remove and serve over rice or couscous.